Submachine gun, while he installed snow-chains on the tires for traction. took Blunk and Saager into town to notify the Sheriff. Peotone's sheriff and a few quickly-deputized citizens. multiple county sheriffs and local constables. 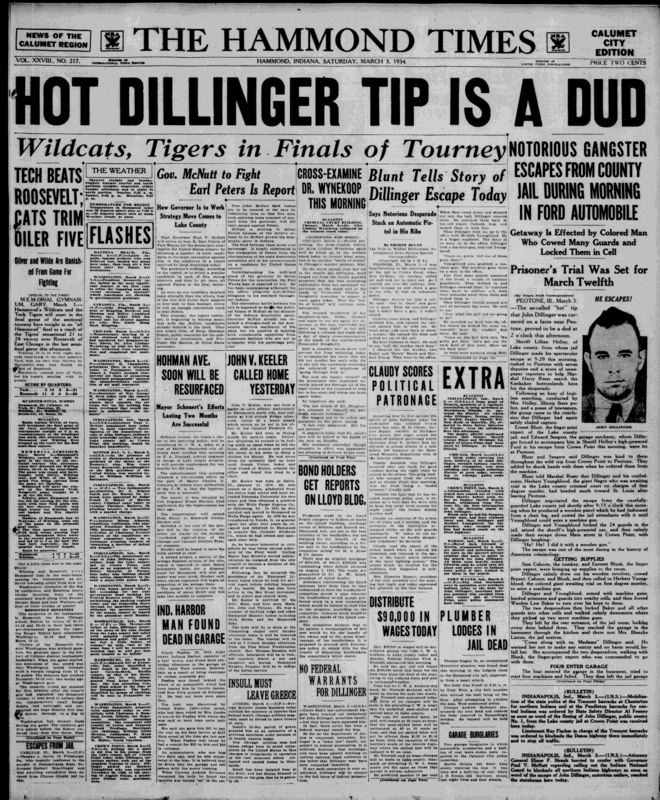 the know” claimed that Dillinger went to Miami Gardens to escape capture. with Baumann still having “Capone’s protection,” just like during prohibition. store on Second Street. Pictured (left to right) are Paul Conrad, Dan V.
Knolton, Jack Cowing, Emil “The Count” Mausehund and Ted Cowing. The sheriff’s stolen 1933 Ford Model 40 V-8 Tudor was found out of gas and abandoned on the North side of Chicago on March 6th, 1934. PEOTONE POSSE SEARCHES FOR DILLINGER - On March 3, 1934, a reporter for United Press covering the story on Dillinger's escape from Crown Point jail, conducted interviews in Peotone, Illinois, with hostages Deputy Ernest Blunk and mechanic Edward Saager. The stolen getaway car was owned by Lake County, Indiana, Sheriff Lillian Holley. To avoid detection, Dillinger had Youngblood remove the police light mounted on the center grille, and ordered Blunk to drive at a reduced speed. Per these first-hand accounts, Dillinger directed their travel from Crown Point, West to Route 41, South to 151st Avenue and West again into Illinois traveling through Beecher. As they drove West toward Peotone, the sheriff’s car unexpectedly veered off the road becoming stuck in the mud. Dillinger ordered fellow escapee Youngblood to keep the two hostages covered with a Thompson Submachine gun, while he installed snow-chains on the tires for traction. Somewhere just outside of town the two hostages were released. Deputy Blunk had been tossed from the slow-moving car, suffering no serious injuries and was luckily picked up by a farmer, Ed Rust. Rust immediately took Blunk and Saager into town to notify the Sheriff. Due to Blunt’s reports, the News of Dillinger's whereabouts were rapidly broadcast using short- wave radios, telling law enforcement that Dillinger was cornered. Blunt knew that Dillinger headed South on Route 49 (today Route 50) and said to pursue him in the areas from Peotone, South to Kankakee but North of Champaign. Sheriff Haley and 4 deputies quickly arrived from Crown Point to provide support to a law enforcement posse made up of Peotone's sheriff and a few quickly-deputized citizens. What happened next is based on old newspaper accounts from The Hammond Times, and several stories that have been handed down from generation to generation. As word spread about Dillinger’s escape, reports of his sightings came in from as far away as Morris and Harvey. Chicago Police dispatched police cars, armed with detectives, to the South in search of the escaped outlaw. Several roadblocks were set up in Morris, Monee, Harvey and including Manteno, Kankakee and Peotone. Law Enforcement thought they had Dillinger cornered. But the only official and verifiable sighting had been the one from Peotone, Illinois, by the two freed hostages. Dillinger, traveling South from Peotone on Route 49, disappeared out of sight, never to be found by the massive army of Illinois and Indiana state police, Chicago PD, multiple county sheriffs and local constables. The posse stories vary, but the one consistent fact has been that “those in the know” claimed that Dillinger went to Miami Gardens to escape capture. Miami Gardens was a well known speakeasy frequented by Al Capone, Frank Nitti and other prohibition era gangsters. Henry Baumann may have been indebted to his original sponsors, and although Capone was sitting in jail, the Outfit was still running this business. Miami Gardens provided hidden underground parking, fuel, lodging, food, entertainment and a great place for a Dillinger to meet up with his gang after his break-out. While it has never been established exactly where Dillinger met up with his gang, Peotone rumors have always supported that John Dillinger did go to Miami Gardens, on Route 49, to avoid being caught. The story was that Baumann was “tipped off” by a phone call from Peotone, and that law enforcement was coming to Miami Gardens looking for Dillinger, allowing time for a getaway. That phone call is consistent with Baumann still having “Capone’s protection,” just like during prohibition. © 2017 National Claim Resources, Inc.